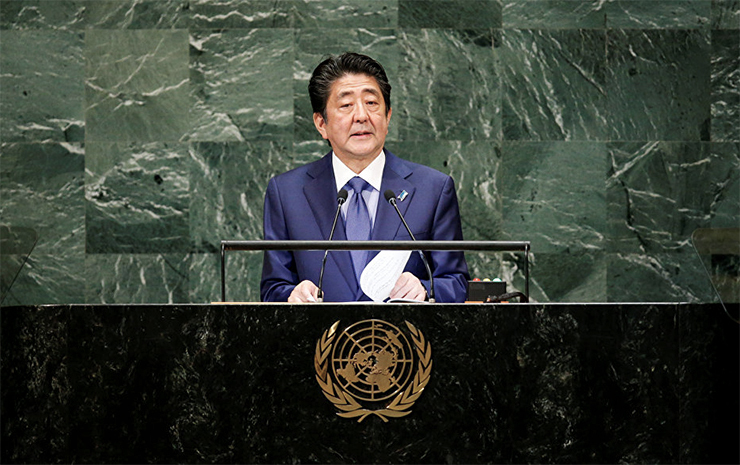 The Japanese Prime Minister Shinzō Abe was in New York on September 25 – 27 this year and attended several important events. The most significant ones included his speech at the annual plenary session of the United Nations General Assembly (UNGA) and his regular negotiations with the US President Donald Trump. Moreover, the meeting of Shinzō Abe and Hassan Rouhani was a very noteworthy event as well. After reminding the audience that “After the war, Japan itself was a nation that enjoyed remarkable growth, basking in the advantages of trade as the beneficiary of a free and open economic system [already established by that time],” he saw none other than his native country that could support and strengthen the aforementioned system in the future. To give examples of specific steps taken in that direction, Shinzō Abe referenced the Trans-Pacific Partnership (TPP) project, which is close to successful implementation, and the conclusion of the Free Trade Agreement with the EU. There is no doubt regarding whom these statements full of sharp rhetoric were addressed to. Namely, the leader of Japan’s key military and political ally that had recently advocated adopting “fair amendments” to the existing international trade system, in particular, to one of its regulators, the World Trade Organization (WTO). Let us remind the reader that the first action made by Donald Trump as the US President was to abandon the TPP. Saving this project from failure was possible mainly due to the extraordinary effort made by Japan. Before we switch to the topics negotiated by Shinzō Abe and Donald Trump, it would seem appropriate to briefly touch upon the highly publicised speech made by the US President at the same General Assembly. The author of this article believes that it contained exceptionally crucial messages for the outside world. Unfortunately, some of them got lost in the comment made by international mass media that presented the speech made by the leader of the World Superpower Number 1 as a ridiculous clown’s performance of a rather inadequate person or (at best) a showman’s enterprise theatre. Though one could read something to that effect between the lines during the incumbent US President’s election campaign, it was probably the first time this thesis was made publicly in such a complete and specific version. This was, undoubtedly, a radical withdrawal from the concept that the US mission is in spreading ‘the values of democracy and liberalism’ (by force, inter alia) on a global scale that had been imposed on the Americans for decades by the so-called neocons. It was in the framework of this mission that the US incurred losses in the trade and economic relations with its foreign partners, including allies. The second statement made by Donald Trump in the UN was aimed at ending this situation, however it had been expressed before as well. For instance, on January 31 this year during his State of the Union Address to the US Congress. The speaker also mentioned the WTO which, in his opinion, was wrong to grant membership to countries that fail to comply with the demands of this organization regarding preventing unfair competition, for instance, by the state support of privately owned companies. The implicit reproach for the large deficit in the US foreign trade was addressed, among other persons, to Shinzō Abe, the leader of the US key ally in Asia, who was present at the session too, because almost 10% of the $800 b figure provided by the US President is the result of the US – Japanese trade. Until now, it had proved impossible to bring together the initial positions of the parties (stated yet again from the UN platform) by negotiations aimed both at decreasing the US negative balance of trade with Japan and at creating conditions for its further development by gradual elimination of the mutual tariff barriers. Tokyo insists on resolving all the issues by having the US rejoin the TPP while Washington DC is currently reluctant to participate in multinational projects of various kinds and advocates bilateral free trade agreements. During the same speech, Donald Trump referenced the recent trade agreements between South Korea and Mexico as good examples of implementing a strategy of the kind. As for the second statement, one should pay attention to the fact that the US – Mexican negotiations were held outside the format of the regional organization NAFTA that comprises the US, Mexico and Canada. According to the Japan Times newspaper, during his negotiations with the US President in New York, Shinzō Abe had to make concessions and agree to the bilateral format of decreasing the mutual tariff barriers. Only in that case would Donald Trump agree to put off the immediate imposition of 25% tariffs on the imported Japanese cars the annual sales turnover of which amounts to circa $50 b on the US markets. However, the crucial details of the fundamental agreement reached (for instance, how fast the tariff barrier elimination process will go) will be discussed by expert groups. Their negotiations will not begin before January 2019 and may very well last until the end of the year. The Japanese car manufacturers allegedly ‘sighed with relief’ when they learned about the one year delay of the resolution of the issue which concerns them a great deal. However, the Japanese farmers were saddened by the prospects of eliminating the tariff barriers for the American pork entering the Japanese markets. Assessing the results of the US – Japanese summit by and large, one might say that both state leaders currently maintain the status quo in the bilateral trade relations. An attempt to reach a compromise brings the parties down to a lower negotiating level. The parties are clearly acting providently still hoping to reach some kind of agreement and realising the significance of the issue which reaches beyond the purely trade and economic sphere. Losing mutual understanding in which would most certainly affect the political component of the US – Japanese relations. Among other events attended by Shinzō Abe during the UN General Assembly session, let us note his meeting with the Iranian President Hassan Rouhani. The very fact that the Japanese Prime Minister met the leader of the country that found itself the target of the harshest philippic during the same speech of Donald Trump is rather remarkable. This will probably limit the Japanese opposition to its key ally regarding the most sensitive issue for the latter. Since there are statements that Tokyo is to stop importing the Iranian crude oil (which is crucial for Japan). Finally, let us note the positions of Japan and China (which are becoming increasingly similar) regarding the need for further development, rather than prevention, of the globalization process and compliance with the existing rules of international trade. Which can become a crucial foundation for improving the political climate in the Japanese – Chinese relations. This is why we are closely following the coming visit of Shinzō Abe to Beijing on October 24, the first one over several years. The specific issues that are to be discussed by the Japanese Prime Minister and the Chinese leadership have already been arranged in New York by the Foreign Ministers Taro Kono and Wang Yi.